In the online video scene the 360 video is something that has definitely been a hot topic during the last year or so, especially as Youtube and Facebook launched support for 360 videos last year. 360 stands for 360 degrees or spherical video where viewer can freely decide the direction that he or she wants to see. This brings of course a completely new world both for a video-maker and for those who are watching the video. 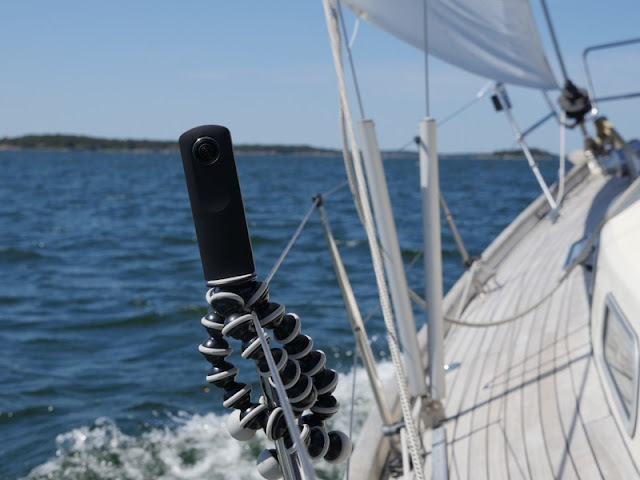 In one of our first sailing trips of the season, I had a chance to finally test out the Ricoh Theta S in action. The filming is very straight-forward as there are not too many manual options available. Also post-production is rather quick as Ricoh Theta's application stitches automatically the two images of the super wide angle lenses into one file, which can then be edited with a normal editing software such as Final Cut Pro. So here it is: our first 360 video. Have a look around by clicking and dragging with your mouse (if using a computer) or by moving your smartphone or tablet around and/or use your finger to change the viewpoint. Previously filming 360 video required some expensive gear such as Nokia Ozo (about $60 000) or for example a rig for multiple GoPro cameras. Also post-production is complicated in these multicam setups as the 360 video has to be stitched from multiple videos which have to be in sync. Recently we have seen a rise of inexpensive 'consumer level' 360 cameras which have two very wide angle cameras shooting in opposite directions. Ricoh Theta S was one of the firsts and the recently Samsung and LG have launched their 360 cameras. Unfortunately, the Samsung's camera work currently only with their newer smartphones and with PC based editing software. It's a pity as the camera has better video resolution than its rivals. 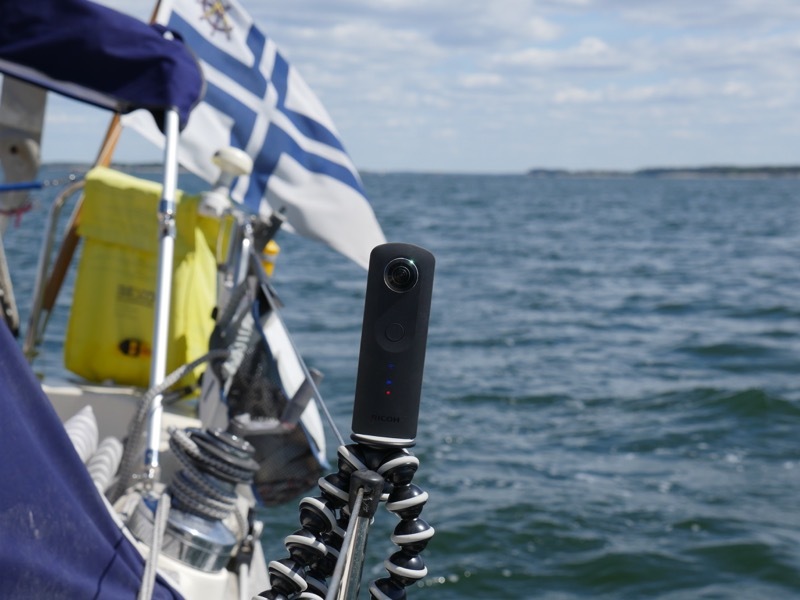 I was a bit disappointed about the video quality of Ricoh Theta S as the video is soft and blurry. Despite the camera is shooting Full HD resolution the actual video resolution is much lower as the image is spread over 360 degrees. Thus, the true video quality is not even close to HD, more like a reminscent of the Youtube quality ten years ago. Thus, Ricoh Theta's 360 video looks best when watched on a small smartphone screen, but the resolution is not enough for larger screens or for VR classes. It is also possible to take 360 photos with Ricoh Theta S and this feature become recently much more interesting as Facebook started to support 360 photos on their platform earlier this month. Furthermore, the image resolution of still photos is greater to videos so the photos have better quality and they are sharper. Thus, I am especially interested about this 360 photo feature. Thanks, I think that in the next few years we will see huge improvment in the quality of these 360 cameras so this is really a beginning of a new technology.